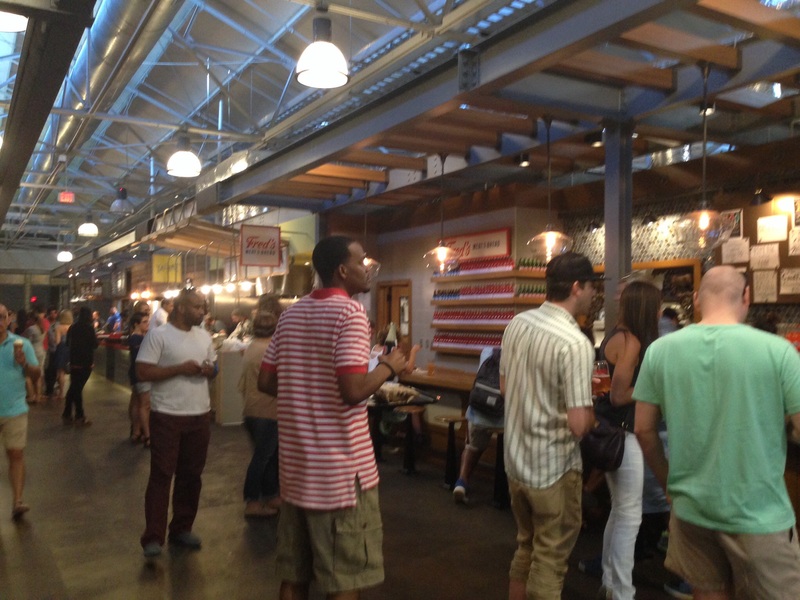 Today, we explore Atlanta, Georgia’s Krog St. Market, an urban food hall and recent addition to Atlanta’s food scene. Farmer’s market it is not, but its eateries and vendors showcase local products, as well as food and craft artisans that appeal to hipsters and Buy Local fans alike. The urban food hall is not a uniquely American phenomenon. Drawing from the traditions of the covered European food markets and stalls, American farmers’ markets, and the efficiency of shopping mall food courts of the 1980s and 1990s, this new hybrid venue has experienced a resurgence in recent years. Pioneered by San Francisco’s Embarcadero, Seattle’s Pike Place Market, New Orleans’ French Market, and others, cities around the U.S. and Europe have given birth to new – or in some cases, revived – markets to showcase local food artisans and their products. Yes, I just said ‘food artisans.’ Their products, much like those proudly displayed at craft fairs, are works of art and creativity in their own right. When I see Mediterranean food – especially hummus, falafel, shawarma, and baba ghanouj – I am immediately drawn to it. So it was natural that I had to try a shawarma bowl from Yalla! This eatery bills itself as a contemporary Mediterranean food stall and is the brainchild of chef Todd Ginsberg, a James Beard semifinalist, Shelly Sweet, and Jennifer and Ben Johnson, a team with other great eateries under their belt (including KSM’s Fred’s Meat and Bread, a sandwich stall). Think of the Chipotle (or, more similarly, Roti) model of menus and food assembly. In addition to salatim and appetizer/mezze plates, Yalla! offers several familiar Middle Eastern/Mediterranean dishes in three forms: pita, laffa (a giant, chewy wrap – like a massive tortilla for all you Mexican food lovers), and bowl. Each is a crazy, multitasking mash-up of ingredients that create one delicious meal. With any of these options, it is nearly impossible not to have to waddle away from KSM (ideally on foot or bicycle down Atlanta’s Beltline trail to burn off those calories and lessen your carbon footprint). The simple – yet so difficult! – menu of Yalla! The chicken shawarma bowl at Yalla! A work of abstract food art and healthy gluttony. For my binge, I chose a shawarma bowl. Lined like an adult, abstract art project with thin layers of baba ghanouj, tahini, and hummus, it is filled with Israeli salad and pickled vegetables, roasted chicken, and most delectably, fried eggplant. The eggplant was phenomenal. I could have eaten a bowl of the eggplant alone. It was that good. The entire concoction is topped with yellow amba, a sauce resembling mustard only in color. It did not look lovely, but it was abstract art I’d be happy to eat anytime (well, maybe just half of a portion). I find $6 to be a bit excessive to spend on one scoop of ice cream. But as a blogger and lover of both making and eating ice cream, I decided it was only my civic duty to eat and write about doing exactly that – even after the heavy shawarma bowl at Yalla. Once I read Jeni’s list of ice cream and sorbets, I had no choice. Wildberry lavender, brown butter almond brittle, sun-popped corn, pistachio and honey, and mango lassi frozen yogurt are just a few of the artisanal flavors Jeni’s offers. If you’ve read any of my own ice cream or gelato recipes, you might not be surprised that I chose the brown butter almond brittle easily as my first mini-scoop. It was a toss-up, but ultimately, the sun-popped corn won me over for the second scoop flavor. It turned out to be an excellent choice. It had that county fair sweet-and-salty kettle corn flavor profile. I would go back for that one. While my wallet and waistline were not fans, my taste buds definitely gravitated towards Jeni’s. If you don’t live or travel to Atlanta, you can still find Jeni’s scoop shops in seven other locations across the USA (spanning from South Carolina to Los Angeles, CA) and try their goodness there! Last, but surely not least, was Xocolatl. How can anyone resist $9 chocolate bars? Sarcasm aside, Xocolatl’s small batch chocolates were rich and complex. Free samples allowed me to see just what $9 can get you. I was impressed with the quality and creativity of their dark chocolate blends – as well as the business’s clever name choice. The latter evokes native chocolate traditions of central and South America, as well as the not so hidden ATL (if you’re not from the American east coast, this is the trigraph for the Atlanta International Airport). I caved and purchased their Oh Nuts! 68% dark chocolate with roasted almonds and vanilla-infused sea salt. On a given day, Xocolatl sells only a fraction of their roster of flavor and sourcing combinations. This is not a problem if you live in Atlanta. Even if you don’t, you can rest assured that this retail stall will sell you a flavor that will excite and delight. #Atlanta#Jeni's splendid ice creams#Krog Street Market#KSM#travel#USA#Xocolatl#Yalla! Previous Post Impress your friends with truffled red pepper coulis!